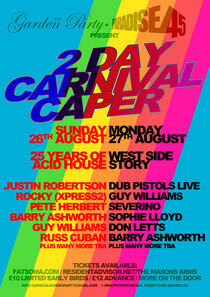 The Garden Party, in honour of Notting Hill Carnival, is back for an 11th year teaming up with Paradise 45 a carnival two-day event! Bringing an all-star line up, The Garden Party will take place over the two days of Notting Hill Carnival and will once again see the Mason’s Arms in Kensal Green transform into a Balearic Paradise. With garden terraces adorned with state of the art décor, razor sharp sound systems and a line up showcasing the best in house, disco, dub and everything in between, Sunday sees the lineup going back to the old school celebrating everything acid house. 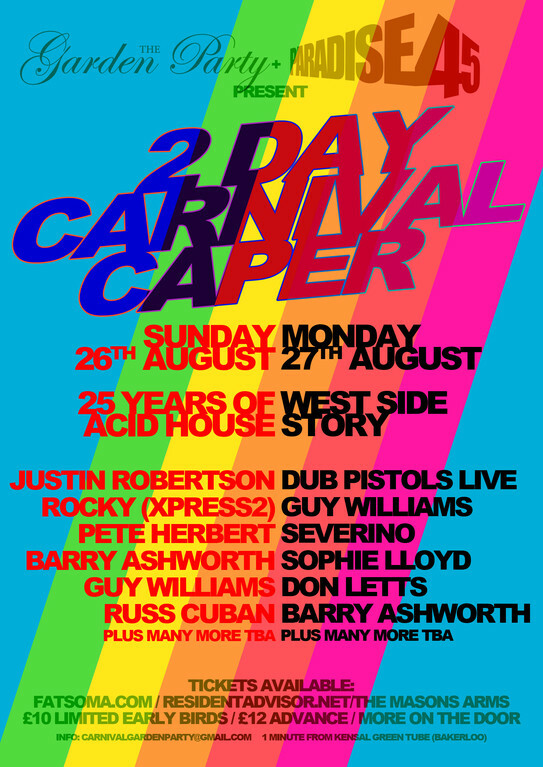 To celebrate 25 years of the classic genre there will be a solid line-up including the man that wears many musical hats and Deadstock 33’s wonder-man Justin Robertson. Rocky from Xpress 2, Barry Ashworth, and international jet-setter Russ Cuban will also be at the helm. Paradise 45 will be hosting the upstairs bar. Best known for their sell out east London soirees, Paradise 45 founder Guy Williams is bringing his Dalston Superstore/East Bloc residency to the Mason Arms. Joining Guy will be Boys Own head Honcho Terry Farley and Pete Herbert at the forefront of the musical assault. On the Monday, taking on the theme of ‘Westside Story’, there will be a widely requested live set from the Dub Pistols, Don Letts and Sophie Lloyd and Horse Meat Disco’s favourite Severino.